Each player chooses a set of same-colored dice. 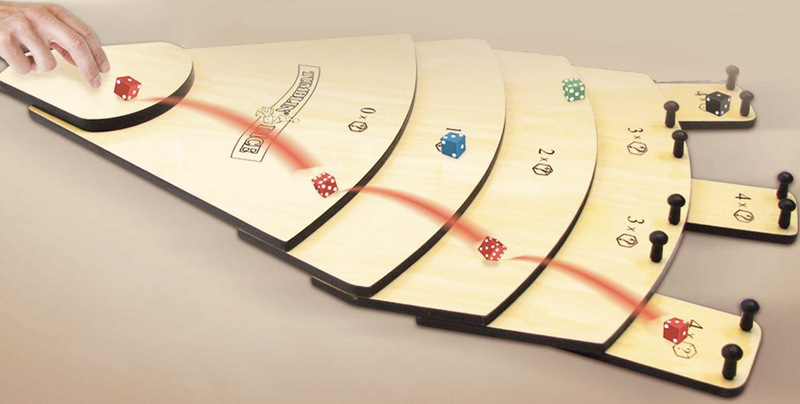 To determine the order of play, each player rolls one die with the highest roll going first, followed by the next highest going next and so on. Use a paper and pencil to record your scores. The first player rolls (or slides or flicks) one die off the launch level - the little "pad" above the "0x level" (zero level). The die is propelled toward the scoring levels below. The die must always make contact with the launch level first. 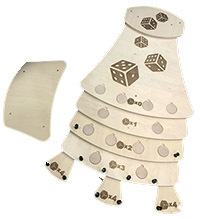 All dice must drop to at least the "1x level" in order to score. If a die does not drop off of the "0x level", it counts as a throw, but it is removed and set off to the side. At this point the first player's die is now resting on one of the scoring levels or has tumbled off the board and is not in play. 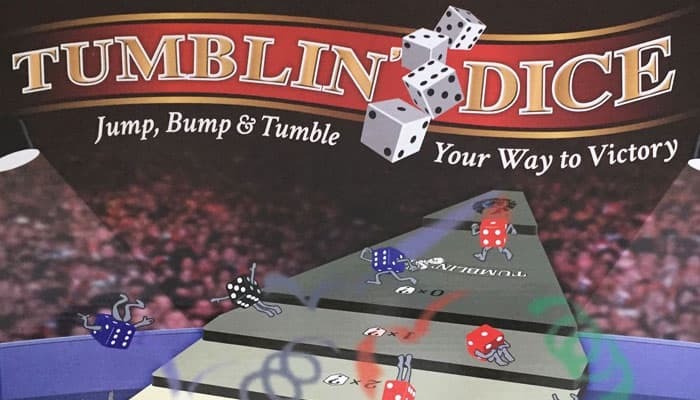 The next player rolls his die off the launch level with the purpose of advancing his own die into scoring position and/or bumping an opponent's die from the board (of course, both of these objectives are simultaneously desirable and possible to achieve). 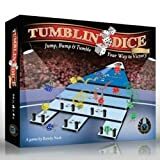 A player may bump more than one die and/or may bump one or more of his own dice to improve his scoring position. Play continues with each player alternating rolls until all four dice of each player have been rolled. At this point the scores are tallied as follows: Multiply the face-up number on the die times the number of the level that the die is resting on. For example: A die which shows a face-up 4, resting on the "3x level" would count for 12 points. The rest of your dice remaining on the board are calculated and added in the same manner. The total of your dice is your score for the round. Collect your dice from the board, table, floor, etc. You are now ready to start the next round. The player with the highest total score at the end of the prior round goes first and the next highest second and so on. If two or more players have the same score, then the order of play between those tied players reverts back to that of the prior round. Play continues until four rounds have been completed. At this point the final score is tallied and the highest score is the winner. If two or more players are tied at the end of regulation, then an overtime round (involving only the players that are tied) is played to determine the winner! Instead of playing four rounds, play to a predetermined score (e.g. 100 or 300 points). If more than one player goes over the predetermined score on the same round, then the player who goes over by the most points is the winner. Instead of playing as individuals, play as teams. Red and green dice versus black and blue, for instance. Determine who will shoot first and second on each team. Turns rotate back and forth between the teams, i.e. teammates never shoot on back-to-back turns. For younger players who have not learned to multiply, they can play by adding the level value to the dice rolled, instead of multiplying. For example: A die is rolled and shows a face-up 4, resting on the "3x level" - the score would equal 7 points (4+3) instead of 12 as in the regular play. This is a great way to play for younger kids just learning to add.